My husband bought one of these a few months ago and quickly became obsessed. I mean he went from thinking it was neat to promoting it so much I often asked if he was getting paid for the positive (and sometimes lengthy) endorsements he was sharing with everyone. 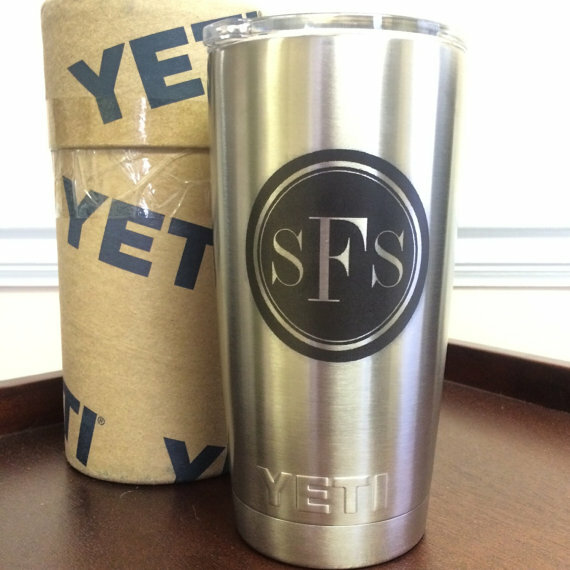 I stole his tumbler now and then so I wasn’t surprised when my very own Yeti arrived a couple days ago – he’s a keeper. So what is it? It’s a tumbler with superpowers: stainless steel, double-wall vacuum insulation, and doesn’t sweat. In short, your cold drinks stay cold and your hot drinks stay hot. I love that I can fill it up with ice and that same ice will still be there a day later. I also love that I can keep it in my car and know it will still be cold when I get back, even in the hottest Tennessee heat. Oh, and did I mention you can have yours monogrammed or personalized with a decal? Tell me that didn’t seal the deal.